Pi Alpha Xi (PAX), the national honor society for horticulture, inducted new members on March 13, 2015. (See photo caption below.) Only the best students in the plant sciences are invited to join this national honor society. Pi Alpha Xi was founded in 1923 at Cornell University and is the Alpha Chapter. Originally, it was the national honor society for floriculture, landscape horticulture and ornamental horticulture. In recent years it has changed and now honors excellence in all of horticulture. 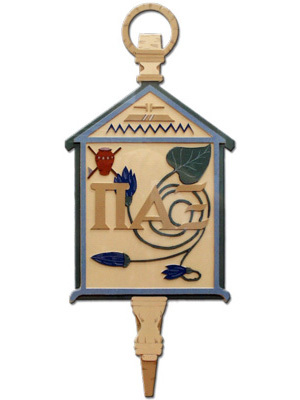 Since its founding, PAX has grown to 36 chapters at baccalaureate-granting institutions. Its mission is to promote scholarship, fellowship, professional leadership, and the enrichment of human life through plants. PAX was very active at Cornell University for many years, peaking in the 1970s. But the chapter went dormant for several years until its revival in 2013. 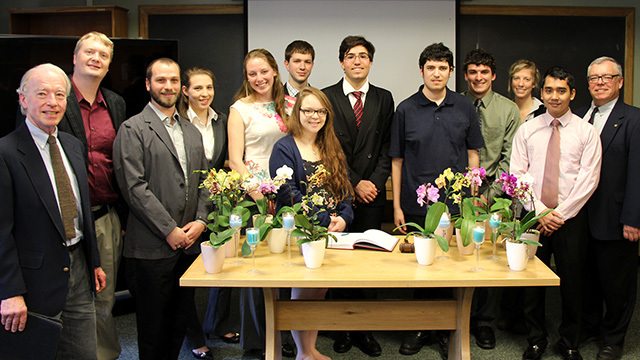 In 2014 PAX activities included a 3-day excursion to visit botanical gardens in the Phildadelphia area and a collaboration with Hortus Forum (Cornell’s undergraduate horticulture club) to revamp the planters in the Plant Science Building foyer. Society members also planted spring-flowering bulbs last fall around CALS that we’ll all be enjoying soon. 2015 PAX inductees and advisors, left to right, Tom Weiler, Horticulture professor emeritus; Neil Mattson, Horticulture associate professor; Ben Stormes, MPS/Public Garden Leadership program; Lauren Fessler ’17; Lindsay Chamberlain, ’17; Karl Kunze, ’17; Catherine Migneco, ’16; Matthew Uhalde, ’17; Jeremy Pardo, ’17; Justin Lombardoni, ’16; Emily Detrick, MPS/Public Garden Leadership program; Nor Kamal Ariff Nor Hisham Shah, MS Plant Breeding; Mark Bridgen, Horticulture professor and PAX Advisor. Graduating members will wear the traditional PAX honor cords of cerulean blue and Nile green (the society’s colors) at commencement. They include graduate students Adam Karl and James Keach and seniors Kaitlyn Anderson, Danielle Park, Jeffrey Janusz and Angella Macias.